In many ways, your hands are the first things that a stranger will notice about you, be it while shaking hands or while handing something over. In this context, it’s essential that you know that your hands are significant indicators of the state of your inner health. This means, by looking at your hands, you or anybody else can guess whether you are healthy or not. If the skin on the palm of your hand is peeling off regularly, it means that you are deficient in Vitamin B. This is particularly true when you see the flaky skin on your fingertips. If you are suffering from this, make sure you take adequate amount of mushrooms, peanuts, avocados and other Vitamin B rich food. In most cases, shaky hands are caused by an excessive amount of caffeine intake. Such cases are not very serious and can be reversed with a little change in your lifestyle. However, they sometime might be indicators of Parkinson’s disease, and thus, you must consult your doctor if the problems persist. Abnormally weak nails are a sign of low zinc levels in the body. Deficiency of Zinc causes inadequate skin development and regeneration. In order to tackle this, you must take food like oats, nuts, meat and wheat. White nails indicate internal weakness. If you have white stains on your fingernails, it means that your blood has low levels of RBC. Inadequate RBC, in turn, leads to inadequate oxygen supply to the nails. If you have Raynaud’s disorder, you are more than likely to witness blue or red fingertips, instead of the normal white. You will experience a chilling sensation on your fingertips which may be accompanied by numbness and shivers. 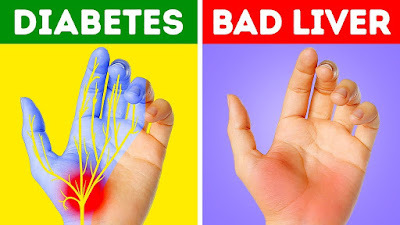 The primary cause behind these symptoms is a shrinking of the blood vessels and veins in the palm area. It can be effectively treated by available prescription drugs. Alongside, you can do your bit in curing the condition, by using gloves. Moreover, you should let go of your habit of smoking and exercise regularly to maintain adequate blood pressure levels. Do you have dry, rough hands no matter how much moisturizer you put on them? It’s possible that you have inflammation of the skin. Technically, this condition is known as Dermatitis and it may also cause rashes and irritation. If the condition is severe, you must immediately consult your dermatologist. In most cases, dry skin can be caused by a deficiency of Vitamin A. Moreover, the condition is worsened by excessive exposure to paper and other similar material. If you find dark colored spots on your hands, then, it is a result of hyperpigmentation. Mostly, it is caused by excessive exposure to direct sunlight. In order to avoid this, you could use effective creams which have SPF to protect the skin against sunlight. So, in all, you must take good care of your hands and must always be aware of the changes in their appearance. In doing so, you could be aware of some severe health issues in advance and can take necessary steps to prevent it.